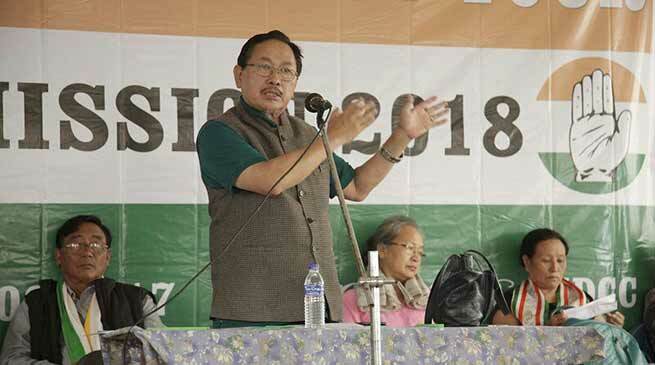 Addressing the public meetings, NPCC President K. Therie said the regional parties have failed to defend the people of Nagaland from communal forces that will erode the special provisions like Article 371 under the Constitution of India, religion, culture, customs and traditions of the Naga people. He said that despite the BJP’s threat to eliminate Christianity from India by 2021 and to plant the Trishul in Nagaland by 2019, not one voice was raised by the MLAs against the BJP’s Hindutva, Uniform Civil Code or the growing intolerance across the nation propagated by BJP forces towards minorities and anyone who voiced against them. Therie said Modi’s failed demonetization and ill planned GST implementation has reduced the nations GDP to 5.7% in the first quarter of 2017-18 fiscal compared to a high of 10.5% during previous Congress Government. Further, growing negative International Trade resulting from the BJP’s intolerance towards Christianity and other religions has left fewer resources for allocation to pay for CSS and other social schemes. He said this was the reason that CSS funds are not being paid in time and the reason for BJP Govt. levying sky high excise rates on fuel and lifting subsidies on petroleum products despite price of international crude oil falling to less than half compared to Dr. Manmohan Singh’s time. He also said lifting of subsidies on fuel including on LPG have hit the common man’s economy adversely. He said the flawed economic policies of the Modi Government are responsible India’s shrinking economy. Therie said leaders today have no ideologies, principles or policies for the welfare of the citizens but have only managed to install an opposition-less Government to corrupt at every level. He said the power mongering of the NPF govt has resulted in multiple defections and 4 Chief Ministers in a single term. Adding that the patience of the people has run out, Therie said that only the Congress can provide the change the people need at this hour. Addressing a huge gathering in Longleng, Therie said the people of the district have suffered the unbelievably bad roads long enough and given opportunity, Congress govt. would give the district a 2-lane all weather road till Mon. Speaking at Zunheboto, Therie recalled the journey of the Naga political movement with Pt. Jaharlal Nehru, Indira Gandhi and Rajiv Gandhi and said that today, every citizen yearns for peace. He reminded that it was the Congress PM P.V. Narasimha Rao that offered talks without preconditions at Dimapur on 22nd Feb.,1996 and said Congress would continue to uphold the policy of non-violence by endeavoring to solve the political problem through peaceful and constitutional means without compromising basic human rights, in line with the forerunner of NPCC, the NNO’s resolution of 1972 at Pfütsero. At Wokha, Therie recalled the Lotha leaders and said that the community has been blessed with abundance of not only resources but also with tall leaders. Adding that the community has produced one of the highest number of bureaucrats who are educated, he called upon the people to help rescue Nagaland by wisely electing stable leaders who can deliver welfare and development to the district. Appealing to party men and women to reach the message to every household, Therie urged not fear money power in elections as it is no longer the equation. He further appealed to the electorate to study the policies and programmes of the party and make a firm decision to elect God-fearing candidates and a clean govt. Others from the team who addressed the programmes included Jarjum Ete, Gen Secy AIMC IC-NE, Jonathan Ao, Gen Secy, NPCC, Capt, G,K, Zhimomi, Gen Secy, NPCC, N. Lucy, President, NPMCC, Vilhousielie Kengruse, President, NPYC and NSUI state President Sentimeren Kichu.